Shard, Britain's tallest building, is owned by Qatar. 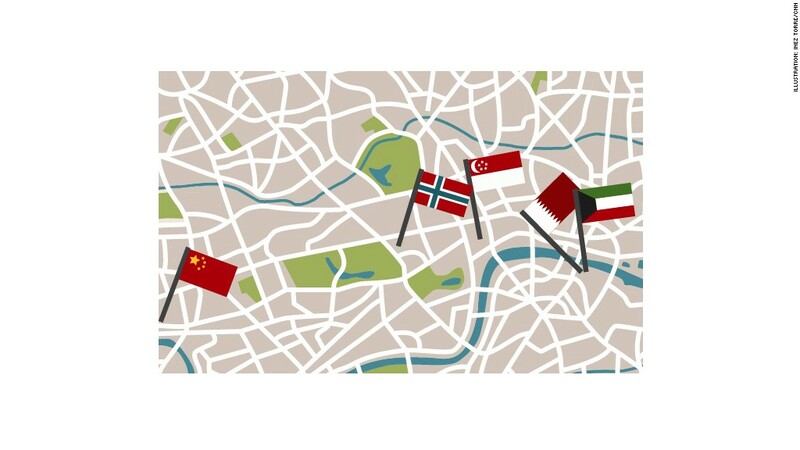 China, Qatar and Kuwait are snapping up London properties. The city's real estate has attracted four times more capital than New York -- the Number 2 choice of foreign governments. Sovereign wealth funds, forked out $8.9 billion for properties in London in the past year. London alone made up 44% of real estate investments of all foreign government money via their sovereign funds, according to research by Real Capital Analytics, a real estate research firm. Qatar was the top spender, with Kuwait, China and Norway close behind. 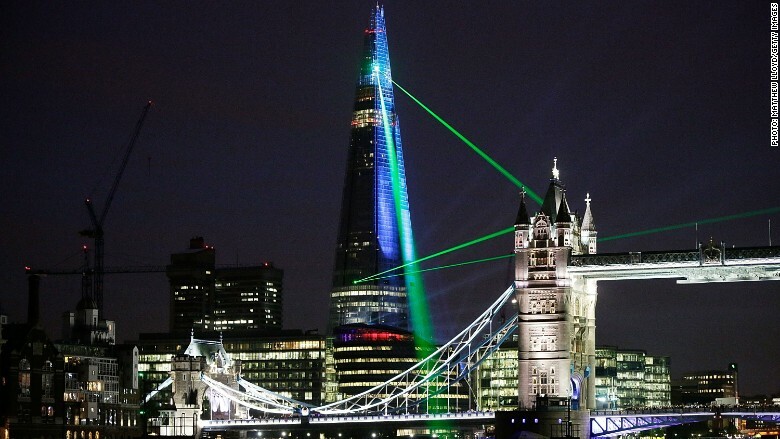 The Qatari sovereign wealth fund owns some of London's most famous landmarks including the E.U. 's tallest building, the Shard, Harrods department store, and the Olympic village. In the last three years, the oil nation has spent $6.3 billion on London real estate. 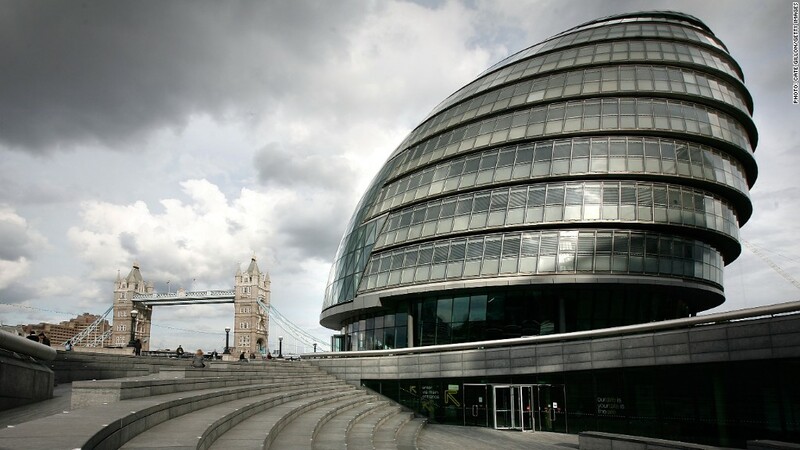 London's City Hall is owned by the Kuwaiti government. China is also pouring money into London. It paid $1.2 billion for the Chiswick Park office development, home to offices of multinational firms like Discovery (DISCA), Starbucks (SBUX) and Paramount (PGRE). Kuwait spent $2.7 billion on the 13-acre More London, a development on the south bank of the river Thames and includes the bulbous-shaped headquarters of London's mayor Boris Johnson. Norway bought a stake in the 400-year-old Pollen Estate in the posh Mayfair section, home to the likes of Ralph Lauren and Chopard. The country paid $544 million to the Church of England for a 57.8% slice of the estate. Key London real estate owned by foreign governments. Simon Mallinson, a managing director at Real Capital said the research showed that London's "trophy buildings" tend to have regular turnover. "(London is) Europe's largest and most liquid real estate investment market," he said. Manhattan came in a distant second with $2.3 billion worth of real estate investments from foreign governments, while Los Angeles was third with $1.5 billion.